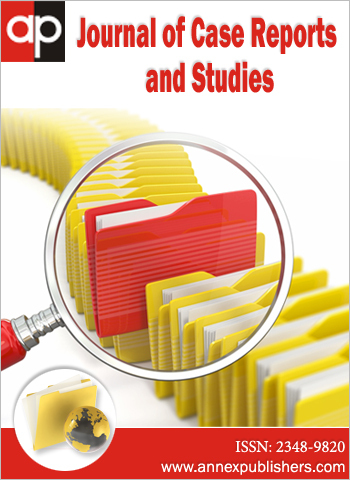 Copyright: © 2014 Cross P. This is an open-access article distributed under the terms of the Creative Commons Attribution License, which permits unrestricted use, distribution, and reproduction in any medium, provided the original author and source are credited. In patients with left ventricular (LV) mural thrombus the novel oral anticoagulants, which include the direct thrombin inhibitor dabigatran etixelate, may be effective and safe alternatives to conventional treatment with heparin and a vitamin K antagonist. However their use for this indication has not been reported. We describe a case and discuss the rationale for undertaking further systematic evaluation of novel anticoagulants for this indication. A previously well 65 year old woman collapsed while sweeping the floor, hitting her head with brief loss of consciousness. She gave no history of chest pain or other symptoms either before or after the blackout. Full blood-count, creatinine, electrolytes, serial troponins and electrocardiograms (ECG) were all normal. 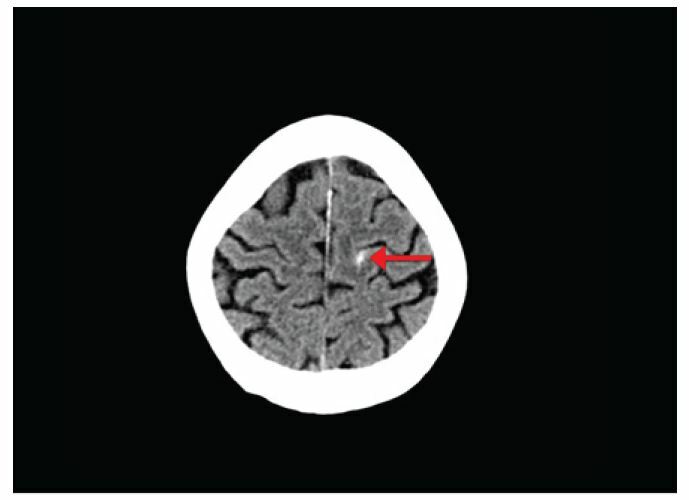 A computed tomography (CT) brain scan demonstated a traumatic subarachnoid haemorrhage (SAH) in the left precentral sulcus (Figure 1). After 24 hours observation she was discharged, but 4 days later she re-presented complaining of palpitations. Admission ECG demonstrated sinus rhythm and new 1-2 mm ST elevation and then T wave inversion in the anterior leads. Serial meaurement of troponin T demonstrated a rise and fall (152, 718, 289 ng/L, 99% for normal 14ng/L) consistent with an acute coronary syndrome (ACS). Because of the recent SAH and stable clinical status she was not treated with anticoagulant or antiplatelet drugs, and coronary angiography was postponed. On day 7 repeat CT head scan showed resolution of the SAH, and coronary angiography identified spontaneous dissection of the mid and distal left anterior descending coronary artery, with good blood flow to the distal vessel (Figure 2). Left ventriculography demonstrated antero-apical akinesia, and a 1.4 x 1.0 cm apical mural thrombus. The mural thrombus was confirmed by echocardiography (Figure 3). Because of the recent SAH she was anticoagulated with dabigatran etixelate 150mg bd rather than warfarin. Neither low molecular weight heparin nor antiplatelet drugs were given. She remained well with no thrombo-embolic event or bleeding. Echocardiography at day 30 showed recovery of LV function and no mural thrombus, so the dabigatran was stopped. There is currently little or no information on use of novel oral antocoagulants to reduce thrombo-embolic risk from LV mural thrombus. In our patient avoidance of anticoagulant and antiplatelet therapy for one week after presentation with acute anterior myocardial infarction (MI) was unsual and prediposed to mural thrombus formation. The cause of MI was spontaneous coronary artery disection, which was managed conservatively without stenting because there was no evidence for ongoing myocardial ischemia, and there is no established benefit from antiplatelet therapy for this indication . Dabigatran was chosen to treat the LV mural thrombus because in the RE-LY trial  the risk of intracranial haemorrhage was lower for patients treated with dabigatran compared to warfarin, and the estimated 10-15% thromboembolic risk from the mural thrombus  was thought to be greater than the low risk of further intracranial bleeding >1 week after a traumatic SAH . Dabigatran and novel oral factor Xa inhibitors have several potential advantages for treatment of LV mural thrombus. A lower risk of intracranial hemorrhage [1,2] may be important in elderly patients and when dual antiplatelet treatment is also indicated after coronary stenting. Initiation and monitoring of early therapy is simpler than for vitamin K antagonists which require several days of intravenous heparin or subcutaneous low molecular weight heparin until therapeutic INR's are achieved. Patient education and laboratory monitoring are also simpler during the early period when both the bleeding and thrombo-embolic risk are greatest. [5,6] These advantages may be particularly relevant when anticoagulation for mural thrombus is only indicated for 3 months, or less, as in this case if the thrombus resolves and LV function improves . Guidelines recommending that patients with or at high risk of LV mural thrombus after acute MI are treated for 3 months with an oral vitamin K antagonist are based on limited data from observational studies [4,7]. This case report supports the rationale for a randomised clinical trial to evaluate the benefits and risks of novel anticoagulants compared to conventional treatment with heparain and an oral vitamin K antagonist in patients with or at high risk of LV mural thrombus complicating MI. 1 Tweet MS, Hayes SN, Pitta SR, Simari RD, Lerman A, et al. (2012) Clinical features, management, and prognosis of spontaneous coronary artery dissection. Circulation 126: 579-88. 2Hart RG, Diener HC, Yang S, Connolly SJ, Wallentin L, et al. (2012) Intracranial hemorrhage in atrial fibrillation patients during anticoagulation with warfarin or dabigatran: the RE-LY trial. Stroke 43: 1511-7. 3 Vaitkus PT, Barnathan ES (1993) Embolic potential, prevention and management of mural thrombus complicating anterior myocardial infarction: a meta-analysis. J Am Coll Cardiol 22:1004-9. 4 O'Gara PT, Kushner FG, Ascheim DD, Casey DE, Chung MK, et al. (2013) 2013 ACCF/AHA guideline for the management of ST-elevation myocardial infarction: executive summary: a report of the American College of Cardiology Foundation/American Heart Association Task Force on Practice Guidelines. Circulation 127: 529-55. 5 Huisman MV, Lip GY, Diener HC, Brueckmann M, van Ryn J, et al. (2012) Dabigatran etexilate for stroke prevention in patients with atrial fibrillation: resolving uncertainties in routine practice. Thromb Haemost 107: 838-47. 6 Connolly SJ, Ezekowitz MD, Yusuf S, Eikelboom J, Oldgren J, et al. (2009) Dabigatran versus warfarin in patients with atrial fibrillation. N Engl J Med 361: 1139-51. 7 Quigley MR, Chew BG, Swartz CE, Wilberger JE (2013) The clinical significance of isolated traumatic subarachnoid hemorrhage. J Trauma Acute Care Surg 74: 581-4. 27 Ramdial PK, Madaree A, Reddy R, Chetty R (2000) bcl-2 protein expression in aggressive and non-aggressive basal cell carcinomas. J Cutan Pathol 27: 283-91. 28 Staibano S, Lo Muzio L, Pannone G, Scalvenzi M, Salvatore G, et al. (2011) Interaction between bcl-2 and P53 in neoplastic progression of basal cell carcinoma of the head and neck. Anticancer Res 21: 3757-64. 29 Heally E, Angus B, Lawrence CM, Rees JL (1995) Prognostic value of Ki67 antigen expression in basal cell carcinomas. Br J Dermatol 133: 737-41. Figure 1: Computed tomography showing a subarachnoid haemorrhage in the left precentral sulcus, (arrow). 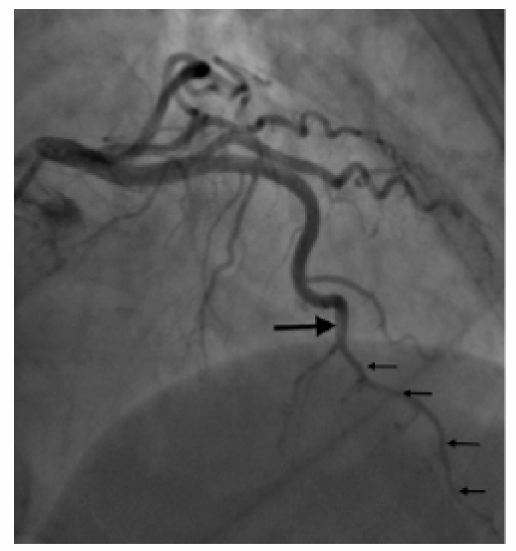 Figure 2: Cornary angiorgraphy demonstrating a linear lucency in the mid left anterior descending coronary artery (thick arrow) and long segment of the more distal vessel with decreased lumen diameter but good flow (small arrows), consistent with spontaneous coronary artery dissection. There was no evidence for atherosclerotic disease in other vessels. 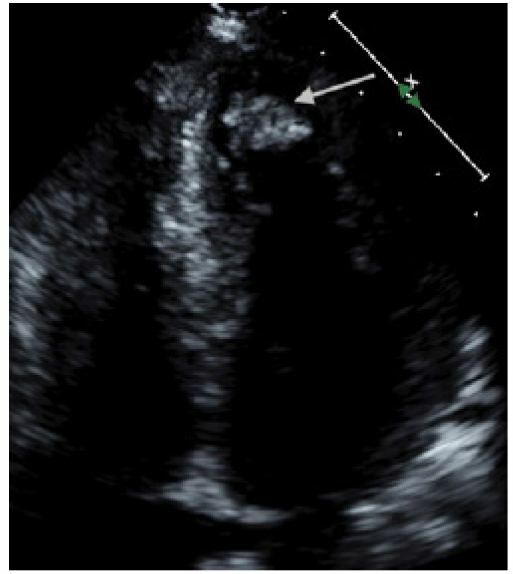 Figure 3: Two dimensional echocardiogram showing left ventricular antero-apical akinesia and the apical mural thrombus (large arrow), which resolved completely after 30 days treatment with dabigatran.